When you need to move materials, shift supplies, or store objects on a job site, a rough terrain forklift can do the job. These advanced machines are designed to tackle tasks on even the most challenging surfaces. Thanks to all the attachments they can use, they're also much more versatile than you might think. 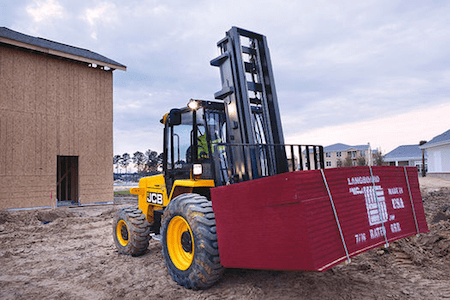 Get to know what rough terrain forklifts can do, find out which type is right for your job site, and learn about the benefits of renting these adaptable machines. Rough terrain forklifts evolved from standard forklifts. These early forklifts first entered the scene at the beginning of the 20th century. In 1923, Yale made the first hydraulic forklift to lift and move materials. By the 1930s, this simple machine caught on at job sites across the nation. When standard pallet sizes launched in 1930, forklifts became even more useful. In the 1940s, forklifts became even easier to use, thanks to batteries that drivers could recharge. In the mid-1940s, producers started to make rough terrain forklifts. These machines could move across uneven surfaces and tough conditions. 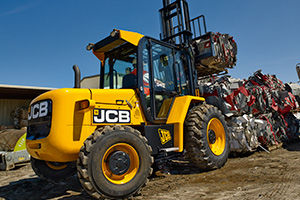 These abilities made rough terrain forklifts vital on farms and construction sites. 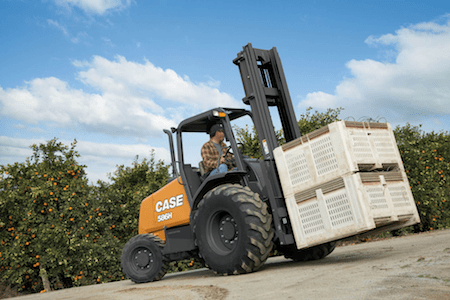 Over the next few decades, rough terrain forklifts became common in both industrial and agricultural settings. As firms added advanced safety features, these machines became more useful than ever. Today, rough terrain forklifts are some of the most versatile machines you'll find on a job site. Improved tech and advanced builds make these forklifts very safe. They may look simple, but rough terrain forklifts are complex machines with many parts. Take a closer look at the most important features to find out how rough terrain forklifts get the job done. The forks are the most visible parts of any rough terrain forklift. These prongs fit onto the front of the machine. There, they can pick up, lift, and move materials and supplies. While many contractors use them to lift wooden pallets, the forks can lift other types of objects, too. All rough terrain forklifts come with adjustable forks. That means you can set the forks narrower or wider to handle loads of all sizes. The wheels and tires are key components that set rough terrain forklifts apart from standard models. All rough terrain forklifts have heavy-duty tires that allow them to tackle outdoor conditions. These tires also have added traction and extra durability. These features ensure that the machines can move safely on loose ground, rocky areas, and uneven terrain. The operator sits in the forklift's cab, which has a reinforced cage to keep the driver safe from injury. Most rough terrain forklifts have safety glass paneling around the cab, too. This feature prevents dirt, rocks, and other objects from entering the cab. Some forklifts offer climate control options to keep the driver comfortable in all types of weather. You'll find the control system inside the cab. Trained drivers use the controls to turn the rough terrain forklift or to drive it forward or backward. They also use the controls to lift and lower the forks or move other attachments. Most rough terrain forklifts have ergonomic controls for easy, intuitive use. No matter their capacity, all rough terrain forklifts have relatively small builds. Their low profile and narrow design allow them to move through confined spaces. Your crew can easily drive these machines through small openings and use them in tight workspaces. This perk makes rough terrain forklifts ideal for busy construction sites with limited space. Also, rough terrain forklifts are designed to last. Thanks to their durable features, they can withstand all types of terrain and weather conditions. Whether you use rough terrain forklifts every day or once in awhile, these machines can handle major wear and tear. No matter what size or capacity you need, you can find a rough terrain forklift for the job. Get a glimpse of the available types to choose a rough terrain forklift that works for you. Many rough terrain forklifts come with either two-wheel drive or four-wheel drive options. As a general rule, 2WD offers less traction on slippery surfaces. However, machines with 2WD tend to be lighter and more agile. In contrast, 4WD offers more traction and easier operation on uneven surfaces. However, machines with 4WD tend to be heavier and less fuel-efficient. 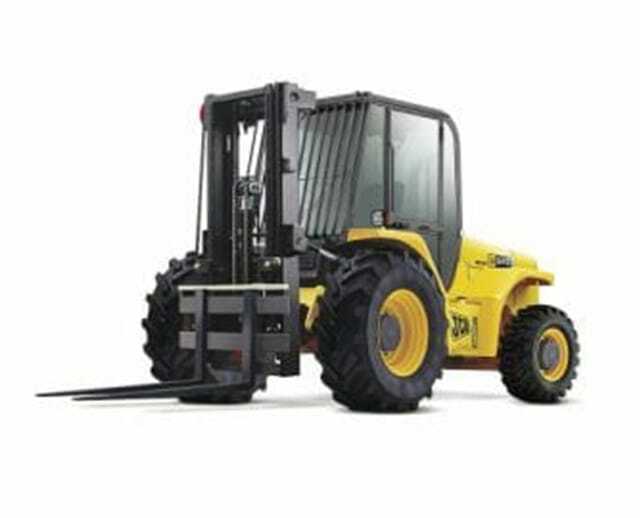 Rough terrain forklifts rely on their masts to lift loads much higher than standard forklifts can. Most models come with multi-part masts that extend as necessary. You can choose from masts that offer lift heights ranging from 15 to 25 feet. Note that in a resting position, the mast is much shorter to allow for limited clearance. One of the biggest perks of rough terrain forklifts is that they can lift big loads. Most models have a capacity between 6,000 and 15,000 pounds. Note that the attachment you use may affect the capacity of the machine, too. Whether you plan to use a rough terrain forklift indoors or outdoors, weight may be a concern. After all, you want to make sure the machine can operate safely without damaging the floor or ground. Most rough terrain forklifts weigh between 10,000 and 20,000 lbs, or between 5 and 10 tons. When you rent a rough terrain forklift, you want to make sure it has enough power to do the job. That's why checking the horsepower is so important. Most models offer 74 HP engines, but some of the most advanced models can reach much higher. If you plan to use a rough terrain forklift in a confined space, dimensions are important. Most models average 8 feet wide and 12 feet long. Always confirm the measurements before renting to ensure you can move the machine through doorways and in tight workspaces. Think rough terrain forklifts can only one task? Think again. These versatile machines can tackle all kinds of jobs. Lifting Pallets: The most popular way to put rough terrain forklifts to work is by lifting pallets. Since the standard forks are sized for pallets, this is an easy task. Depending on the mast height, you can lift them up to 25 feet off the ground. Shifting Supplies: Whether or not your supplies are palletized, you can shift them around with a rough terrain forklift. Since these machines can handle all kinds of terrain, you can shift supplies almost anywhere on a job site. 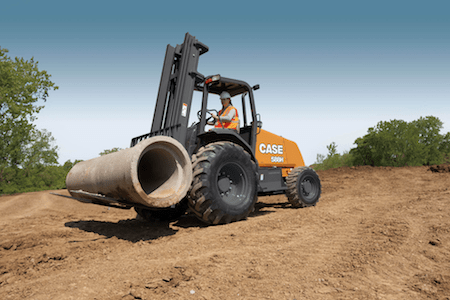 Moving Materials: With a rough terrain forklift, moving materials around a job site is easy. You can move gravel and sand from one location to another. You can also move backfill away or put it back into place. Loading and Unloading: Rough terrain forklifts can load and unload tractor trailers quickly. While moving palletized loads is fastest and easiest, these machines can load and unload a variety of objects. Storing Objects: Thanks to their ability to reach a dozen or more feet in the air, rough terrain forklifts can store objects, too. Use them to move supplies or small equipment from the job site and into storage. Cleaning Surfaces: Rough terrain forklifts are so versatile that they can even clean up after themselves. Add a broom attachment to yours to tidy up work areas and construction sites. 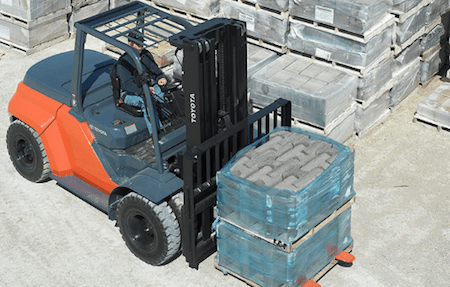 Unlike standard models, rough terrain forklifts can work in some settings. Since they can work on all kinds of job sites, rough terrain forklifts are some of the most versatile small machines. Construction Sites: Whether you're working on a residential, commercial, or industrial construction site, there's a good chance you're dealing with several types of terrain. Rough-terrain forklifts are ideal for construction sites because they can handle everything from loose dirt to finished flooring. These machines can also tackle steep grades, even with a heavy load in tow. Manufacturing Areas: While rough terrain forklifts aren't designed for indoor use, you can put them to work in enclosed spaces. Since they can easily move from indoor to exterior jobs, these machines are remarkably flexible. They work well in manufacturing settings with steep grades and a range of terrain types. Green Spaces: Since rough terrain forklifts can handle loose ground and can move backfill, they work well in green spaces. Use these machines to tackle residential or commercial landscaping jobs. They can move bricks, pavers, and other supplies over grass, gravel, or dirt. Farms: Rough terrain forklifts are ideal in agricultural settings. These forklifts can speed up tractor trailer loading and unloading, and they can handle major wear and tear. These machines can also navigate fields, pastures, pens, and loading areas. Extreme Weather: Since rough terrain forklifts come equipped with high-traction tires, they can tackle all kinds of weather conditions. Put them to work in the mud after a rainstorm or in the snow after a blizzard. Although your crew members should take extra precautions for extreme weather, these machines can handle muddy, icy, and snowy terrain. Rough terrain forklifts might look like they can only tackle one type of job. With the right accessories, however, they can do all kinds of tasks. Take a look at some of the most common attachments and find out how they get the job done. The most common attachments for rough terrain forklifts are pallet forks. With most models, you'll get two forks that allow your crew to pick up and lift all kinds of pallets. Standard pallet forks measure 4 inches wide by 42 inches long. If you need a custom length, look for forks ranging from 36 inches to 96 inches long and 2 to 5 inches wide. Not all forks are designed to lift pallets. Lumber forks are designed to pick up logs cut wood of all sizes. These forks come in a range of lengths. The main difference between these and pallet forks is that lumber forks are more tapered. This feature makes it easier to pick up lumber that rests directly on the ground. While most forks come in twos, cubing forks usually come in groups of four or six. These forks tend to be tapered, and they may be narrower than pallet forks. Cubing forks work best for moving and placing cube-shaped loads of bricks or solid blocks. 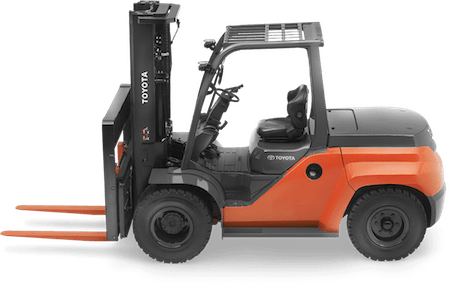 No matter which type of forks you use, most rough terrain lift trucks allow operators to change the fork placement so you can move loads safely. However, most models have a few limitations. You can't place the forks at an angle, and you can't place them wider than the load backrest. If you need to move wide loads safely, fork spreaders can help. You may need to place a custom order to get fork spreaders with the right dimensions. Forks can do many jobs, but they can't move loose ground or smaller materials. Instead, you'll need a bucket attachment. If you're planning to move brush or loose materials in the bucket, consider a grapple bucket. This attachment uses a hydraulic claw to keep materials in place during movement. If the forklift's mast doesn't provide enough reach, a tower can add a few extra feet. Some offer up to 8 feet of height for more flexible loading and unloading. Many rough terrain forklifts can also handle work platforms. If you need to move crew members, supplies, and materials a few dozen feet off the ground, a work platform is a smart choice. When you add a work platform to a forklift, you can save your team from investing in an additional aerial lift. Rough terrain forklifts help your crew move materials, supplies, and workers safely. To prevent injuries and accidents, your crew members should follow a few key safety tips. First, take the time to train your whole crew to use rough terrain forklifts. Occupational Safety & Health Administration (OSHA) standards indicate that every forklift driver needs training before use. General forklift training helps your crew members get familiar with using the equipment. However, they need training specific to rough terrain forklifts. Offer both classroom training and hands-on training to make sure your team knows every aspect of the equipment. Your crew members also need training for each model they use on the job site. After all, every model has different controls and features that your crew needs to understand. Track each crew member's training and note each worker's completion date. Before using a rough terrain forklift on the job site, your crew members should always inspect the equipment. They should look for flat tires and signs that the machine needs repairs. Checking for issues before use can help prevent accidents and keep the equipment running smoothly. As your crew members use rough terrain forklifts on the job site, they should always look out for common hazards. For example, your team should take care to operate each machine at a safe speed. The make of the machine, the size of the load, and the ground conditions may affect what speed will prevent accidents. All rough terrain forklifts have a backrest that keeps the load in place. However, uneven loads and those that exceed the machine's capacity can cause problems. Drivers should know the capacity of the machine to prevent tipping due to overly heavy or improperly balanced loads. Rough terrain forklifts are designed to tackle uneven surfaces. However, some conditions and surfaces can cause rollovers. Always check the grade of the work area and confirm that the forklift can handle it safely. In many cases, proper tire inflation and tread are also key. Your crew members should check tire inflation before starting a job. They should replace tires with low tread to avoid traction issues on loose ground. While you'll typically use a rough terrain forklift outdoors, some models can operate indoors. Make sure your crew members understand which models and fuel types are safe for indoor use. Never use a diesel engine, internal combustion gas, or propane powered lift truck models in confined spaces for long periods of time. Even when you have an experienced crew, collisions can happen on the job site. To prevent forklift collisions, encourage drivers to watch for obstacles at all times. Devise a job site plan with safe driving routes for rough terrain forklifts and other heavy-duty machines to lower the chances of any accidents occurring. Once you've found the right type of rough terrain forklift for your job site, the biggest decision you'll have to make is between renting and buying. For most contractors, renting offers a long list of benefits that make it the clear choice. Cost is often a concern for contractors, and for a good reason. Purchasing a new rough terrain lift truck can cost up to $100,000. With a price tag that high, buying a new machine outright requires a major investment. If you haven't planned for such a big purchase, you might not be ready to write a check. In some cases, you might be able to take out a loan to cover your costs. However, borrowing money for new equipment could use up all of your available credit. That limits your ability to take out a loan for other key business needs. To save money on an equipment purchase, some contractors buy used machines instead. That can lower your costs, but it also means you'll get an older machine. After all, a pre-owned machine won't have the newest technology or features. Relying on older tech can mean slower work, which can cost you more money. In contrast, renting a rough terrain forklift can help you keep your costs in check. You can rent a machine for a single day to keep costs as low as possible. You can also save on a monthly rental, which costs a fraction of purchasing a new machine. Renting a rough terrain forklift also gives you access to the newest technology. Whether you want a model with climate control, extra horsepower, or the greatest lift capacity, BigRentz has what you're looking for. When you rent heavy-duty equipment, there's no need to compromise. Simply rent the machine you need and get the job done. Remember that the price of the equipment isn't the only cost you'll incur if you purchase a forklift. When you aren't using the machine, you'll have to pay to store it. If you only need to use it a few times a month, storage costs can be expensive. When you rent, you only have to keep it on site when you need it. When you finish the job, end the rental period without arranging for storage. If you own, you'll also have to pay maintenance and insurance fees. 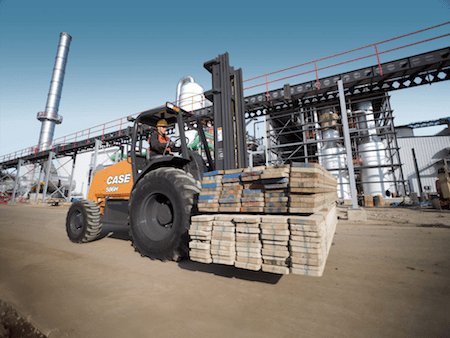 Using a rough terrain forklift regularly can require frequent tune-ups. If you're on the hook for the cost, you'll have to budget for maintenance. When you rent with BigRentz, however, you don't have to worry about maintenance or insurance. Your equipment will arrive ready to use, and BigRentz will handle your tuneup needs. When you rent a rough terrain forklift, you don't have to wait long to get to work. BigRentz can arrange next-day or even same-day rentals so you can keep your project on schedule. BigRentz handles delivery and transportation to save you even more hassle. Ready to get to work? Contact BigRentz at (888) 325-5172 to find the right rough terrain forklift for your job site. Whether you need a small or large model for a day, a week, or a month, BigRentz has the rough terrain forklift your crew needs.